The water in Penn Cove (Coupeville, WA) turned orange on 5/8/04 due to a "red tide." Photo courtesy of Mary Jo Adams (copyright 2004). Major factors influencing red tide events include warm ocean surface temperatures, low salinity, high nutrient content, calm seas, and rain followed by sunny days during the summer months (NOAA). 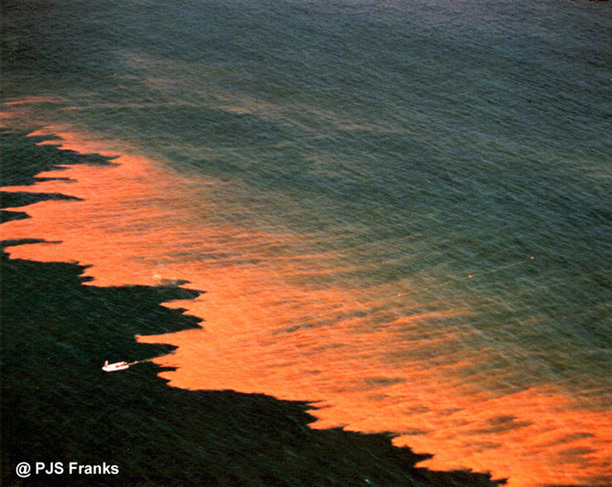 In addition, algae related to red tide can spread or be carried long distances by winds, currents, storms, or ships. Where Are Red Tides Found? Red tide is a global phenomenon. However, since the 1980s harmful red tide events have become more frequent and widespread. Detection of a spread is thought to be influenced by higher awareness of red tide, better equipment for detecting and analyzing red tide, and nutrient loading from farming and industrial runoff. 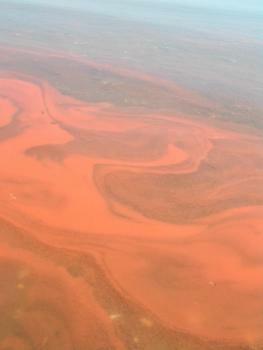 Countries affected by red tide events include: Argentina, Australia, Brazil, Canada, Chile, Denmark, England, France, Guatemala, Hong Kong, India, Ireland, Italy, Japan, the Netherlands, New Zealand, Norway, New Guinea, Peru, the Philippines, Romania, Russia, Scotland, Spain, Sweden, Thailand, the United States, and Venezuela (WHOI, 2007, CDC, 2012). How Are Red Tides Harmful? This Alexandrium species can cause paralytic shellfish poisoning. Image taken by David Patterson and Bob Andersen, provided courtesy of the microscope website. Paralytic Shellfish Poisoning (PSP) - This disease is caused by the production of saxitoxin by the Alexandrium species. It is common along the Atlantic and Pacific coasts in the US and Canada. Poisoning occurs when one ingests shellfish contaminated with PSP toxins causing disruption of nerve function and paralysis. Extreme cases may result in death by asphyxiation by respiratory paralysis. 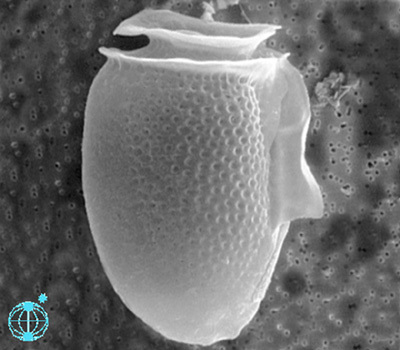 This Dinophysis species can cause diarrhetic shellfish poisoning. Image taken by Mona Hoppenrath, courtesy of the microscope website. Diarrhetic Shellfish Poisoning (DSP) - This disease is caused by the Dinophysis species. It generally occurs in Japan and Europe, but it has also been found in other countries such as Canada, the US, Chile, New Zealand, and Thailand. Symptoms of DSP include diarrhea, nausea, vomiting, abdominal pain, and cramps. DSP is generally not lethal. Amnesic Shellfish Poisoning (ASP) - This disease, which has been found along the eastern Canadian coast, is caused by domoic acid producing planktonic and benthic algae, including Pseudo-nitzschia pungens forma. Pseudo-nitzschia multiseries and Amphora coffaeformis. 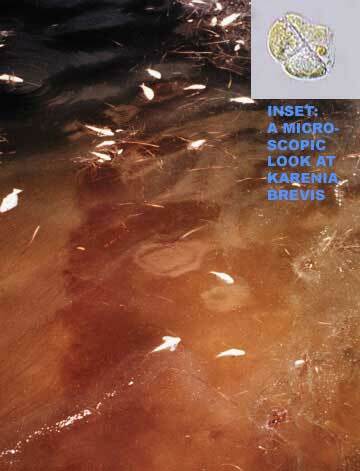 It can also be found in soft shell clams and blue mussels infected by Pseudo-nitzschia delicatissima. Gastric and neurological symptoms include dizziness, disorientation and memory loss. What is Being Done About Red Tide? Technological advancements such as satellite imagery have allowed scientists to better track and monitor harmful algal blooms. Tracking and monitoring red tide algae helps reduce harmful effects of the algae by providing warnings against eating infected shellfish and against swimming in infected waters. For example, the Sarasota Operations Coastal Oceans Observation Lab (SO COOL (more info) ) has developed instruments that can test for red tide algae in coastal waters. Finally, researchers are attempting to develop an antidote to the red tide toxins. Interestingly, while developing such anti-toxins, researchers have found a possible cystic fibrosis (more info) treatment. General Collection Resources such as news articles, web sites, and reference pages provide a comprehensive array of information about red tide and other harmful algal blooms. Advanced Collection: Compiled for professionals and advanced learners, this red tide collection includes resources such as journal articles, academic reviews, and surveys. For Educators: This red tide collection includes activities, assignments, and reading materials created specifically for educators. For additional resources about red tide, harmful algal blooms, and related issues search the Microbial Life collection.